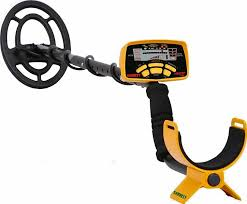 metal detector is around £180 brand new and is available from quite a few stockists. The Garrett Ace 250 gets a lot of glowing reports and some detectorists never feel the need to upgrade from it. Although the colour scheme is a bit like marmite ( you either love it or hate it). Unfortunately for me though my experience with this metal detector was not the best. Don't get me wrong it found the goodies but it did seem to have a few issues that grinded on me. The first being its annoying tones ( another marmite subject) which consist of bings and bong noises depending what the metal is under the coil, however the lcd display also shows some insight as well. Another problem for me is the lcd display is set towards the US market showing dimes and nickels. Unfortunately the biggest issue I had with the Garrett Ace 250 was that sometimes you would get a good signal but upon digging a clod of soil the signal would disappear as if there was no find there in the first place. After a while I lost confidence in the machine and this is what caused me to sell it. To set up the Ace 250 is pretty straight forward, there are plenty of pre-set modes to choose from depending on what you are hunting for. I found it was a lot more sensitive if run in all metal mode and then use the sounds to judge if it was iron or not. This way you do not lose depth like you do with discrimination on. Another point to note for set up is that when you set the sensitivity its best to start at level four, then increase the sensitivy one setting at a time until the detector becomes unstable. Once this happens notch back on the sensitivity one level so its stable again and run it at that. Overall the Garrett Ace 250 metal detector has thousands of users worldwide who love their machine to bits, they cant all be wrong. This metal detector was my first so many of the problems I found could of been down to user error but I feel I need to be honest about my experience. Garrett Ace 250 metal detector review submitted by John R, Carlisle. I have been using my Garrett Ace 250 for the best part of two years now and absolutely love it. So far I have found a couple of hammered silvers and also plenty of artefacts with it. There are many reasons I like the Garrett Ace 250 but some of the main ones are it's weight, its ease of use, the performance you get for your money and also the fact there are many after market coils available for it. I only have one complaint to make about it, and that is I don't get on with the pinpoint function very well, however this does not matter to much as I use a pro pointer. All in all I don't think I will be in any hurry to upgrade from my Garrett Ace 250 metal detector although I may upgrade to a larger coil in the near future. Falling out of love with metal detecting. Its time I got back on the permission hunt.